UK manufactured steel door available in a range of sizes/colours. See Specification below for full details. Side hinged garage doors are available in the same range of materials as the up and over range (Steel, Upvc, Timber, GRP). 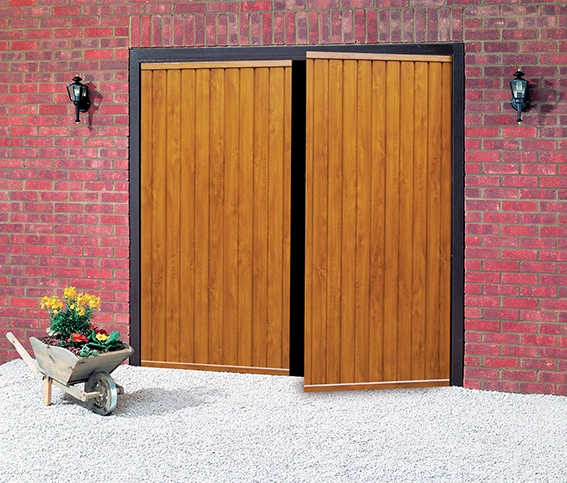 They are popular ‘traditional’ looking doors and ideal if there are obstructions in the garage. They feature excellent security and the construction is very durable. Please Note: All of our garage doors, unless otherwise stated, come complete with lock/handle/fitting pack and full instructions. Sizes displayed are for the door size only so do not include any frame sizes. Sizes shown are given Width x Height. We recommend you order the door with the matching steel 50mm frame (50mm on the head) for ease of fitting. The steel doors that we sell are constructed using premium grade galvanised steel making them both secure and corrosion resistant. 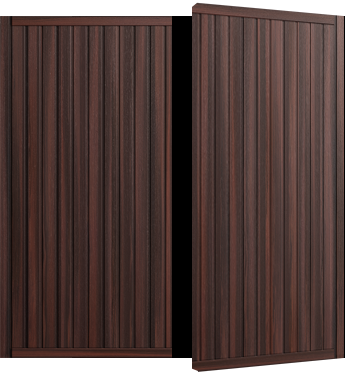 We have the largest range of finishes available for these doors including powder coated solid colours (we can also quote for any specific RAL colour upon request) and laminated wood effect finishes. The doors are manufactured in Britain and have unique deep pressed panels giving a high level of panel detail.